We’ve tried just about every trick in the book to improve performance in both our daily drivers and racecars. One of these tricks is using a cheap bottle of octane booster. Unfortunately, they don’t always work like some companies claim. That’s why we reviewed the best octane boosters on the market to find out which ones live up to the hype and deliver actual results. The chart below shows which octane boosters actually increase octane rating. Editor’s Note: AKI stands for Anti-Knock Index. AKI is the octane number that’s listed on the gas pump (i.e 87, 89, 91). Our top pick for the best octane booster is NOS Racing Formula because according to scientific tests it increased octane by 4.6 AKI compared to Lucas Octane Booster which achieved an increase of only 3.5 AKI. Have you tried any of these brands? Vote for your favorite octane booster below or leave a review of a different brand at the bottom of the page. Most companies that sell octane boosters do a great job of being vague about their potential results. 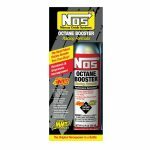 However, one reason we like NOS Octane Booster is because you know exactly what you’re getting when you buy their product. They state very simply that the Racing Formula octane booster will increase octane by 31 points or 3.1 full octane numbers. That means you can increase your 92 octane fuel to 95.1 with a single bottle. These stats were backed up in an independent test. The results of the test showed that NOS Octane Booster produced an additional 46 points or 4.6 octane numbers when mixed at a concentration of 60:1. That means you’ll need to add 2.13 ounces of octane boost per gallon of gasoline. 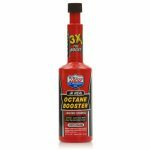 The NOS Octane Booster Racing Formula is designed for off-road use only – which makes it a great way to improve the performance of your race car without spending a fortune on race fuel. Like a few other octane boosters on our list, this product contains Methylcyclopentadienyl manganese tricarbonyl or MMT for short. It is a compound that can be found in your pump gas and is used boost the octane rating. In addition to MMT, NOS Octane Booster also includes “Powertane,” Nitro Methane and other unique lubricants. Although the list of ingredients sounds like it came from the lab of a mad scientist, this product has many benefits beyond just boosting octane. In fact, it is safe for oxygen sensors and catalytic converters. That being said, some people have claimed that MMT will cause damage to spark plugs overtime. Even if you don’t spend much time at the racetrack, an octane booster will help improve your fuel efficiency and prevent stalling or hesitation. NOS claims it will even reduce hydrocarbon and carbon monoxide emissions. Since we are all huge motorsports fans in the HCDMAG.com office, it’s hard not to love Lucas Oil products. After all, they sponsor racers in just about every form of motorsports including drag racing, monster trucks, motocross, off-road trucks and more. Heck, they even sponsor professional boxers and an NFL stadium! But, we won’t let those facts stand in the way of an honest review of Lucas Octane Booster. The fact remains that Lucas Octane Booster exceeds the performance of other brands like Royal Purple or NOS Octane Boosters which deliver up to 30 points of boost. That’s an increase of 36 points or 3.6 octane numbers! 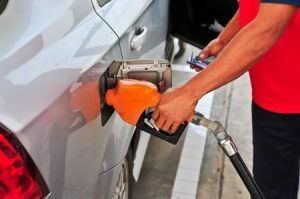 At a concentration of 1.28 ounces of octane boost per gallon of gasoline, only one bottle is needed to make 10 gallons of 93 octane fuel into 96.6. The same test results showed that when used in a concentration of 50:1, the same 93 octane fuel was increased to 98.4. That means you’ll need to add 2.56 ounces of octane booster per gallon of gasoline. We are the kind of guys don’t take B.S. from anybody. When we are looking for an octane booster, we want to know exactly what results we’ll get – no fluff. That’s why we like Royal Purple Max Boost Octane Booster. Right on the package it says that it will raise your octane by 30 points or 3 numbers. No flashy claims or gimmicks – just the facts. That means it will increase 87 octane gas to 90 with one bottle. Like other octane boosters this one is not street legal and is designed for racing use only. 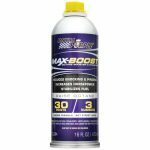 However, in non-racing conditions Royal Purple Max-Boost will improve fuel economy, reduce engine knock and even clean deposits from fuel injectors. Of course, it will give you more horsepower, too. The 104+ brand has been around since 1975 and has been the go-to octane booster until recently. Not too long ago it was easy to sell a bottle of octane booster with nothing but a flashy tagline like it “Boosts Power!” Today, however, consumers are more savvy and there are dozens of competitors with actual octane boosting results. Over the years we’ve bought dozens of bottles of 104+ Octane Boost and used it to some satisfaction. Yes, it does give you a little extra power when you step on the gas. How much extra power? Well that is debatable. In several tests published online, 104+ Octane Boost has been shown to improve gas octane by about 9 points or about 1 octane number. If this is less than you were hoping for, you may want to try 104+ Maximum Octane Boost which has “double the octane boost” of the original formula. However, if you aren’t as obsessed with maximizing your octane boost like we are, 104+ has some other benefits as well. It will help you get better gas mileage and clean your fuel injectors at the same time. In addition, if you car seems sluggish at stop lights or when merging onto the freeway, an octane booster could help cure these problems. Although, this formula is designed for off-road use only, the manufacturers claim that it is safe for use in all vehicles. The reason most octane boosters are labeled as not street legal is because they are not registered with the EPA for on-road use. 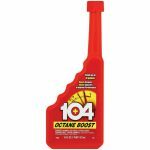 The last we checked you can buy a bottle of 104+ Octane Booster for under $10 online. Although this brand did not win the title of “best octane booster” it does offer many benefits for about half the price as other products we reviewed. When Lucas Octane Booster claims that it has 3 times more boost than leading brands, in our opinion this is the product they are referring to. 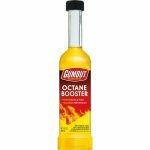 According to Gumout test results, their octane booster will give you an additional 8 points or 0.8 octane numbers. In simple terms, that means one bottle of Gumout Octane Booster will increase 93 octane gas to 93.8 AKI. While not a huge bump in performance, it may be just enough to get your car to stop pinging or knocking. Another reason we have used Gumout on several occasions is because it’s cheap (usually under $7) and it can be found almost everywhere we’ve checked. Unlike the other products we reviewed, the package does not specify that it is for off-road use only. Our guess is that it does not contain the powerful octane boosting ingredients, such as MMT, that are highly regulated by the EPA. We’ve read dozens of customer reviews of Gumout Octane Booster and the vast majority are positive. I guess that means most people that have tried Gumout are not looking for a boost of 30 plus points. Instead, they just want a little extra performance without having to buy premium fuel.